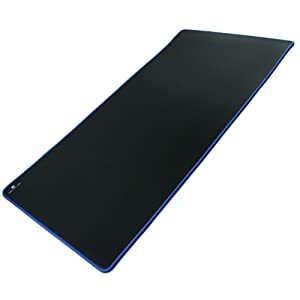 Glorious 3XL Extended Mat is our top choice because it is gloriously huge, it protects your desk, offers everything you need for gaming and more. Premium materials for Comfort, performance, and durability. Do you need any special accessories to have a good gaming experience? 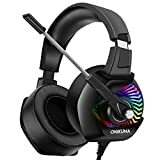 It’s definitely possible to have a good time playing with a really basic setup, but some products can make gaming more comfortable and can even improve your performance. Extra large mouse pads are one such upgrade that can elevate the experience of both gaming and work. Which extended mouse pad is right for you? To help you answer that, I’ve created a guide showcasing the top 10 best extended mouse pads of 2017. This list was curated based on extensive research and testing and it will help you choose the right mouse pad for you. The mouse pads were all evaluated in terms of style, performance, durability, and other factors. 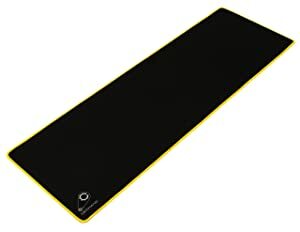 With dimensions of 48 inches x24 inches, this extra large mouse pad is big enough to comfortably fit both keyboard and mouse. The black cloth surface on the glorious extended pad is a great-looking, smooth, and built to last. I like that there aren’t any graphics other than the Glorious logo in the bottom right corner. Some other mats have graphic backgrounds that look nice but can ultimately distract you. The frame stitching is designed to prevent fraying and it really does stand the test of time, even with regular use. This mouse pad has it all, striking the perfect balance between speed and control. The rubber base will keep the mat firmly in place without the chance of it slipping around and hurting your play. At 3mm, it’s thick enough to make it comfortable without being too thick. I love that this mat rolls up when not in use, making it great for traveling. 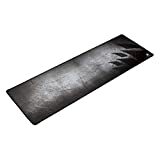 You should try to avoid eating and drinking while gaming but if you do and you spill, this glorious gaming mouse mat is machine washable and will come out good as new. If you do spill liquid on the surface material, you don’t have to worry because it is waterproof. This gaming mouse pad is at a higher price point but the price is entirely reasonable given all the benefits. This great-looking 3XL mouse pad is gloriously huge, it protects your desk, offers everything you need for gaming and more. It doesn’t have quite as large of a footprint as the Glorious 3XL, but the Razer Goliathus is plenty big. It measures 36.22 inches long by 11.57 inches tall. This is more than enough room for a keyboard and mouse to fit comfortably. 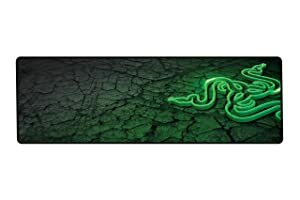 Each of the Razer Goliathus mouse pad designs features some large and bold graphics. If Overwatch is your game, you’ll enjoy the design of this specially themed mouse pad. Other mouse pads in the Goliathus line feature the Razer logo of a bright green three-headed snake over eye-catching background designs. There are some really great looking designs but all of them are pretty intense and could potentially be distracting. Razer‘s line of extended mouse mats is split into two categories, control, and speed, with mats in each group customized for maximum performance in that area. If exact precision is the most important factor for you, the control extended mouse pad is a good choice. All of the mats will help you achieve high performance overall, but the specialized lines will give you a little extra edge where you need it. The textured weave on these mouse pads is comfortable and durable, though it’s not super slick and smooth. The rubber backing ensures that the mat won’t be slipping and sliding all over the place. With the bold graphics, these extended mouse pads aren’t for everyone. That said, they are durable mats that will help players achieve optimal performance, especially with the specialized focus on either speed or precision control. 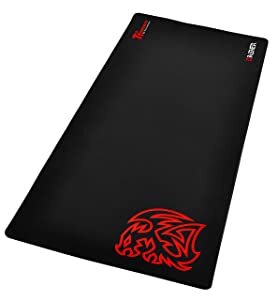 This extended mat from Tt eSPORTS has an ideal size. It’s almost as long as the Goliathus at 35.4 inches but it gives you a few extra inches on the vertical size at 15.75 inches. This means it offers pretty much exactly the space most people need without feeling cramped. It also has a small enough footprint that it will fit on most playing surfaces easily. The micro-textured fabric is black with just the Tt eSPORTS logo in a bold red in the lower left corner. It’s a nice looking mat that will make most gamers happy with its top-notch performance capabilities. You have to admit, it looks pretty damn good! The non-slip rubber base will help prevent slippage and the surface will help the gamer achieve both speed and accuracy. Some mats will start to fray or curl at the edges over time, but this high-quality mat is really durable so you shouldn’t have that problem. The surface of the mat is slightly rough but it is also quite slick. This makes it great for high-precision accuracy but the slickness can take some getting used to. In addition to looking nice and helping players achieve great results, the mat is just thick enough to provide comfort to get you through hours of play. Excellent performance, solid construction, and a clean, simple design make this extended mousepad worth considering. If you want an extended mouse pad that offers excellent performance and comfort but don’t want any distracting graphics, this might be the one for you. 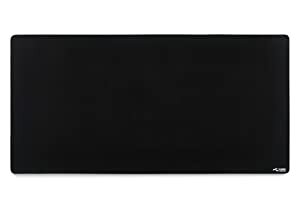 This very large (36 inches x 18 inches) mat has a clean design, with a black surface and a tiny white logo in the bottom right corner. This minimal design lets you focus all of your attention where you want it, whether in work or a game. A simple design doesn’t mean this mat can’t compete. In fact, it can stand up to many of the other Extra Large mouse pads on this list. It has a non-slip rubber base and a cloth weave surface that has a low-resistance glide, improving accuracy. The mouse pad is durable and will continue to look great and function well for years. One especially nice thing about this mouse pad is that it will look great in a professional office environment, something that can’t be said for some of the other mouse pads on this list. If you’re looking for an extended mouse pad that will work for both gaming and the daily grind, the SubZero is a one of the best choices. The SubZero Gaming TYKA is a versatile and trustworthy mouse pad that stands out for not standing out visually. This extended mouse pad from HyperX is another large mat with a simple design. Most of the mat is a basic black. The red and silver HyperX logo is in the bottom right corner. This mat is particularly comfortable with a soft cloth surface and some nice padding. This will help minimize wrist strain, especially over a long session. The mouse pad surface is very smooth to the touch but there is some very fine texture that ensures you can achieve precision accuracy with your mouse. At 35.43 inches by 16.54 inches, it’s an ideal amount of space for most people’s needs. It also rolls up for easy transport, making it easy to take it between home and work or to tournaments. This mat is also very easy to clean. The edges feature anti-fray stitching and have the same flat profile as the rest of the mat so there is no bump. No matter your style of play, this mat has you covered with a consistent glide for speed and micro-texture for precision. The back of the mat has textured natural rubber that should keep it firmly in place. However, you might experience just a hint of sliding on some surfaces, like glass tabletops. Another great feature of the HyperX Fury S Pro X-Large pad is the great warranty. The construction is high quality and the materials are durable so it’s unlikely you’ll need it, but the 2-year warranty can provide some peace of mind. 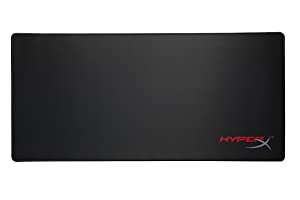 HyperX products are consistently excellent and this extended mouse pad is no exception. Some of the previous corsair gaming mouse pads have had some serious fraying problems but they’ve taken care of it with this anti-fraying model. The stitched edges look nice and make this a very durable mat. This edging doesn’t lay perfectly flat and flush with the rest of the mat, so it could potentially bother your wrist. It has some nice dimensions, with a length of 36.6 inches and a height of 11.8 inches. A bit more vertical room would be nice but this footprint will fit nicely on most playing surface setups. The design is somewhat busy yet it’s also rather muted and subdued thanks to the grayscale color palette. This extended mouse pad design is very nice looking and as a bonus, it can help disguise dust or stains from spills. Of course, dust or stains could interfere with the performance so you will need to pay attention and take care of the mat regularly. A rubber base should keep this mat firmly in place without any sliding around. The textile weave cloth offers low-friction movement and precision accuracy. The surface has a nice smooth feel to it and it’s pretty comfortable. Perhaps the best part of this mouse pad is its low price point. It provides a ton of value for the money. The Corsair Gaming MM300 is a high-value mouse pad with a striking design. Like the Corsair gaming pad, this XXL extended gaming mouse mat from Cmhoo offers a lot for the price point. 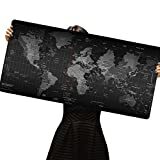 There are several unique designs to choose from with this mat. One features a stunning grayscale world map. Other options include an old American flag and an outer space scene. There are also some simple designs with a basic black and a color edge. There is even a solid white design. None of these mats have a logo, something none of the other mats on this list can boast of. In addition to some great and unique design options, this mat also delivers on performance. Both speed and precision accuracy can be achieved with this mouse mat. It’s also durable, with anti-fray edging. The large surface area of 31.5 inches by 15.7 inches is more than adequate for most people. A rubber base provides non-slip stability. The high-quality construction can stand up to machine washing so you can just throw it in the washer if it suffers a spill or otherwise gets dirty. The textile weave cloth offers low-friction movement and precision accuracy. The surface has a nice smooth feel to it and it’s pretty comfortable. Perhaps the best part of this mouse pad is its low price point. It provides a ton of value for the money. This extended mouse mat stands out for offering a lot of value and giving you the choice of several unique designs. If you want the best extended gaming mouse pad on the market, this is not it. But if you want to spend as little as possible for a decent gaming pad, the Combaterwing is worth checking out. For the price point, it’s really surprising how good this mouse pad is. The design is a simple black with red edging and a red logo in the upper right corner. The material gets dirty easily but it’s very easy to clean and it’s fully waterproof. Measuring 27.6 inches by 11.8 inches, some people may find it to be a bit too small, but it provides enough room for most. The stitched edge is raised a bit so it has the potential to be a bit uncomfortable. It’s described as anti-fray but the materials and construction aren’t super high-quality so there could definitely be some fraying over time. The manufacturer does offer a 12-month worry-free product guarantee, though, so if you do see wear quickly, they will take care of it. The surface is quite smooth and provides great speed and control. It’s soft and relatively comfortable but it’s fairly thin so it’s not quite as comfortable as it could be. Layering this on top of some cheap foam could make it more comfortable. All in all, I was shocked with how good this gaming pad is. For such a low price point, it offers an incredible amount of value. It’s not the best, but it’s a great option if you can’t afford to spend much. 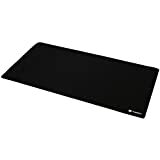 My second editor’s choice on this contest for the best extended mouse pad is a mat with a great simple design that will look nice in the workplace as well as part of a gaming mouse setup. Most of the mat is black, with your choice of colored edge stitching, and there is a small white Dechanic logo in the lower left corner. For the most subdued and professional look, you can choose the solid black extended pad with black edge stitching. This is one of the thicker gaming mats, at 6mm, and you can really tell in the comfort level. It has a nice plushness and smooth cloth surface that will help reduce fatigue. The construction level on this mat is best in class and you shouldn’t encounter any fraying. A antislip rubber base keeps the mat firmly in place so you don’t have to worry about any sliding during intense play. The edge stitching is a bit raised and could be irritating to the wrist depending on your style of play. This mat does help provide good control, but it really shines in the mouse tracking speed department thanks to the slick weave. Like many gaming mats, this one ships rolled up. It does seem to take longer to fully flatten than other mats but it will flatten eventually. If comfort is really important to you, you’ll like the plushness of this double thickness mat. It also has a nice clean design and it’s great for speed. A drawback to many of these extended gaming pads is they are a bit too short. With nearly 18 inches of vertical space, that’s not a problem with this mat. In addition to its great footprint, this mat is nice and thick. If you’re spill-prone, you’ll appreciate that this mat is waterproof and machine washable. The surface is extremely smooth and the lack of resistance means speed won’t be a problem. The mat is also designed to help you achieve precision pointer accuracy and it definitely delivers. A rubber backing keeps the mat in place without the risk of it sliding around at the worst moment, though this will be less successful on certain surfaces. This is a large and stylish gaming mouse pad that delivers in all the right areas. The extra vertical space is what really makes it stand out. Razer Goliathus: Speed VS Control – What to Buy? One of the best extended mousepads for gaming is the Razer Goliathus. But how do you choose between the two different versions of this mat? Both have excellent tech specs, It all comes down to what you value more. With the speed mouse pad, you can count on really smooth and seamless movements. If you require a lot of quick mouse movements, the speed option might be a better choice for you. The control mat, on the other hand, will help you be as accurate and precise as possible. There is a bit more friction on this mat, letting you be accurate down to the pixel, the type of cloth gaming pros who favor precision will like. In a lot of games, that level of precision can make all the difference. Both mats are great choices but the right one for you will depend on your style of play and what you value most. Should I get A Wrist Rest as Well? Adding a wrist rest to your gaming set up might be a good idea, especially if you play for many hours at a time, pc laptop or any other setup where you use a mouse. The mouse & keyboard set up will definitely feel different with a wrist rest and it will take getting used to but you could save yourself pain and damage later on. Repetitive strain injuries can occur when the ergonomics aren’t ideal and a wrist rest can help prevent this. However, the way you position your wrist on the mouse and the angle of your forearm and wrist can also go a long way toward preventing injury. A wrist rest might not be necessary if your physical positioning is already ergonomically sound. If you’re already feeling pain when gaming, investing in a wrist rest is a good idea. Thickness mostly comes down to personal preference. Some people just prefer the feel of a thinner mat and others love the feel of a thick mat. If your table or desk surface is uneven in any way, a thicker mat can help disguise this. If you play regularly in tournaments or at parties where you don’t know what kind of surface you’ll be playing on, a thicker mat can help ensure the feel is pretty uniform across surfaces. Typically, the thicker the mat is the more comfortable it will be. A thinner mat will feel more sturdy and not unlike a hard surface. Is there a good substitute for a Mouse Mat? Not exactly. Any hard surface can work to an extent but depending on the surface, things like speed and accuracy could suffer. It’s also likely to not be as comfortable. A hardcover book or a magazine can work in a pinch but it won’t really compare to a mouse mat. A hardcover book or a magazine can work in a pinch but it won’t really compare to a mouse mat. My mouse pad keeps moving, any trick to keep it from sliding? Most of these mouse pads have an anti-slide rubber backing and should stay in place. Depending on the playing surface you are using, though, you might experience some slippage. You can try dusting off both the surface area and the rubber side of the mat. Dust can prevent the mousepad from getting a secure grip. If that doesn’t work, you can try using a thin double-sided tape to keep the mousepad in place. A thicker tape or even duct tape can also work but it might make the surface uneven which you generally don’t want. You can also try using a thin non-slip mat in between the mousepad and the playing surface. Another option is to try is spraying the bottom of the mouse mat with hairspray. This can have a slightly adhesive effect that will keep the mat firmly in place. Hopefully, this guide has helped answer your questions about extended mouse pads for gaming and helped you select a good model for you. Every single one on this list has something to offer, I hope you enjoyed my extended mousepad buying guide. Have you tried any of these best-selling extended mouse pads for gaming or work? What did you think? Let us know if you have any questions or comments. Happy gaming! HereON.biz is a participant in the Amazon Services LLC Associates Program, and we get a commission on purchases made through our links.